CH. 35 Debuts EWDD + LAHTA video highlighting culinary careers in L.A.
Home / City of Los Angeles / CH. 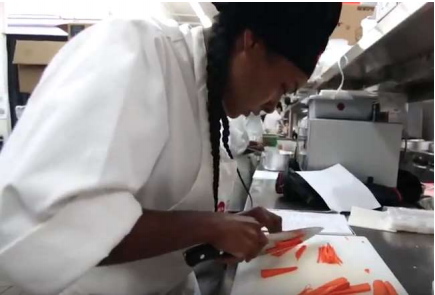 35 Debuts EWDD + LAHTA video highlighting culinary careers in L.A.
LA CityView Channel 35 debuted “Preparing for a Career in Hospitality,” on March 7, 2018, a 6-minute video sponsored by EWDD highlighting how aspiring chefs can receive culinary training through the City of Los Angeles Economic and Workforce Department and the Los Angeles Hospitality Training Academy (LAHTA). The video includes testimonials from a successful LAHTA graduate who now works in the kitchen at the Sheraton Gateway LAX, along with interviews from executive chefs at area hotels and the Staples Center outlining opportunities in LA’s growing hospitality industry. “Culinary arts is particularly exciting because it has no boundaries on age. Young or old, you are able to work in culinary arts,” said EWDD General Manager Jan Perry, who was also featured in the video. Jan praised EWDD partner LAHTA for being a tremendous partner and for providing low-income individuals free-of-charge, hands on training for jobs in the leisure and hospitality industry, which is one of the largest employment sectors in Los Angeles. Hospitality, which provides more than 355,000 jobs throughout the region, is expected to grow, with an estimated nearly 19,000 jobs to be added this year. EWDD and the City of Los Angeles Workforce Development Board (WDB) provide grant financing to LAHTA, who acts as an intermediary to train WorkSource Center participants for jobs in the hospitality industry. As part of the video, LAHTA instructor Chef Mitchell Frieder led a cooking demonstration of what LAHTA students learn with 12-year-old chef prodigy Zion Otaño, who was featured in Man vs. Chief: Chef Showdown on the FYI network. Watch the video on the LA CityView Channel 35 YouTube channel. The buffet, prepared by LAHTA’s current Culinary Apprenticeship Program students, featured a menu of poached, chilled salmon, coq au vin, sautéed flounder, chicken fricassee, Korean kalbi jim, braised sweet and sour pork, and tasty reuben and Italian sub sandwiches. The students, who receive support services from EWDD’s Boyle Heights, Watts/LA and Wilshire Metro WorkSource Centers, served the gourmet buffet to practice preparing food for large banquets and events. One student, whose previous job in the kitchen included “preparing hundreds of rice balls,” proudly showed the vegetables he prepared for the Poule au Pot, a gourmet chicken soup dish served that night. Prospective employers for the students include the Westin Bonaventure, the Beverly Wilshire and Flying Food Group, a caterer for international airlines and retailers. With nearly 250 available hospitality positions available through LAHTA in early March, EWDD and LAHTA will continue working together to find and train candidates looking to find roles in the region’s growing leisure and hospitality industry.